When using Multiple Monitors connected to a Windows computer, the Monitor Switcher can be used to switch mouse cursor between different monitors. Switching between various monitors in Windows can be really difficult and the Monitor Switcher feature of the software presented here can make the task of switching between monitors really easy. This functionality is useful when using multiple monitors connected in Extended Mode on Windows computers such as Windows 8, Windows 7, Vista, etc. When using multiple monitors in clone mode or when using a Monitor Switch, this functionality might not be useful, however you may like to checkout other features of the MurGeeMon software. Whether you are using a Single Monitor or Multiple Monitors connected to your Windows Computer, the Applications accept input in same ways. Applications accept input from user using Keyboard & Mouse input. When providing Mouse Input (in the form of clicks, double clicks, etc) to applications, the operating system switches the focus to that particular application and the application with focus receives the mouse input and processes the input provided to it. Multiple Monitors on Windows Computer are arranged in a bigger virtual desktop. The Arrangement of the Monitors decides how to move mouse cursor from one monitor to the other. In case you have large number of monitors connected to your Windows computer, it can be really hard & time consuming to move the mouse cursor to various other monitors and the Monitor Switcher functionality presented here offers a Configurable Keyboard Shortcut to switch Mouse Cursor to other Monitors connected to the Windows Computer. As displayed in the above figure, the Monitor Switcher has been configured to move the mouse cursor to the next monitor on the press of keyboard shortcut F7. Yes this keyboard shortcut is configurable and can be changed or removed with ease. 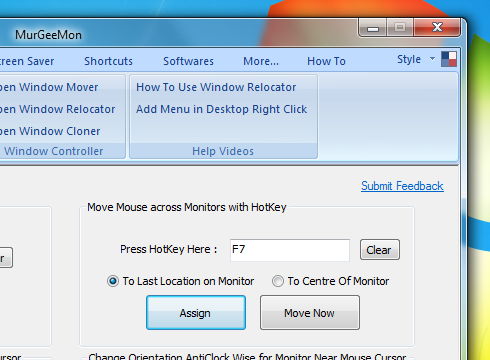 You also have the option to decide how the Monitor Switcher should locate the Mouse Cursor onto Other Monitors. You can select either of the two available options for placing the mouse cursor on other monitor. The first option is to place the Mouse Cursor to the last location on the monitor and the second option is to place the Mouse Cursor at the center of the Monitor. This Monitor Switcher will not move any application windows to other Monitors. It will just place the Mouse Cursor to the next Monitor in Monitor Chain of a Multiple Monitor Windows Computer as configured. Yes the software presented can be used to move application windows to other monitors as well, but you would need to create a different shortcut for that purpose from the Shortcuts tab of the Dual Monitor Software. Benefits of using Monitor Switcher is that you can reduce hand movements to move mouse cursor across monitors. In order to navigate to other Monitors, all you would need to do is press the Keyboard Shortcut configured and then you can use the hand movements to interact with the operating system or application windows. The Monitor Switcher works on Windows 7 , Vista and other Windows computers and is fully compatible with Windows 8. The same software download works for 32 bit and 64 bit versions of windows, download the software now and use Monitor Switcher to switch between monitors easily, quickly and save your time and efforts.